Although very common, there is nothing ordinary about these magnificent dark birds. They are excellent fishers and highly adaptable. They are said to have a penchant for vomiting when threatened. (I have considered using this method myself, but luckily, it has been a long time since I have felt threatened!) People blame cormorants for declining fish populations; these long necked black birds are the bane of fish farms everywhere. 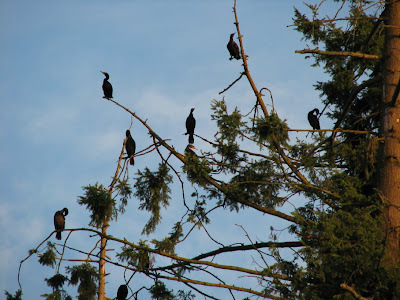 I found this elegant bunch lounging about in the trees around Eagle Harbor. What interests me is that here, in America, fishermen and aquaculturists shoot cormorants or employ other lethal methods of taking out the competition they sometimes refer to as "the black plague." Meanwhile conservationists boast the increase in populations of a species previously on the brink of extinction. They are the topic of much controversy in Europe as well, and each nation seems to have their own attitude about the bird. A good article has been published by the Science Daily about the varying approaches to these birds. In China, however there is a traditional method of fishing that claims one good cormorant can feed an entire family. At night, fishermen shine lights over the water to attract fish to the surface, then use a cormorant tethered by a ring around its neck to catch the fish. Because of the ring, the bird cannot swallow and thus spits up the fish whole. After enough fish have been caught for the night, the fishermen release the noose and let the birds eat. It must be quite a sight to see these men navigating their bamboo boats at night across the water, with the great black birds perched on their boats awaiting the signal to dive! And as for fish farming, it seems, like many profitable endeavors, a good idea has turned into a disaster. I am currently reading "Bottomfeeder: How to Eat Ethically in a World of Vanishing Seafood" by Taras Grescoe. Eye opening! He addresses health, ecological, social, and ethical issues surrounding the food we eat and how it gets to our tables. In one example, he sites a case where a single piece of salmon traveled over 22,000 miles before making it to a dinner plate! If you love seafood and want to make informed choices, I highly recommend this book.